Book your lodge accommodation at Sesriem/Sossusvlei and explore the oldest desert in the world. If you prefer a guest farm or require family friendly accommodation near Sesriem/Sossusvlei then click through and make your booking. For the more adventurous traveler there are many good camping sites available. Stay at a lodge on the edge of the second biggest canyon in the world – the Fish River Canyon. The Naukluft Mountains are ideal for hiking and walking but still close enough to Sossusvlei for day trips. Book your accommodation or campsite at one of the nearby lodges or guest farms. If you are planning on visiting Luderitz you have a good variety of hotel and guest house accommodation. The Kalahari Desert offers some excellent luxury tented camps and there are also comfortable game lodge accommodation. Southern Namibia is an exciting part of your self-drive tour and offers accommodation for all types of travelers. The village of Aus is located in the south of Namibia. 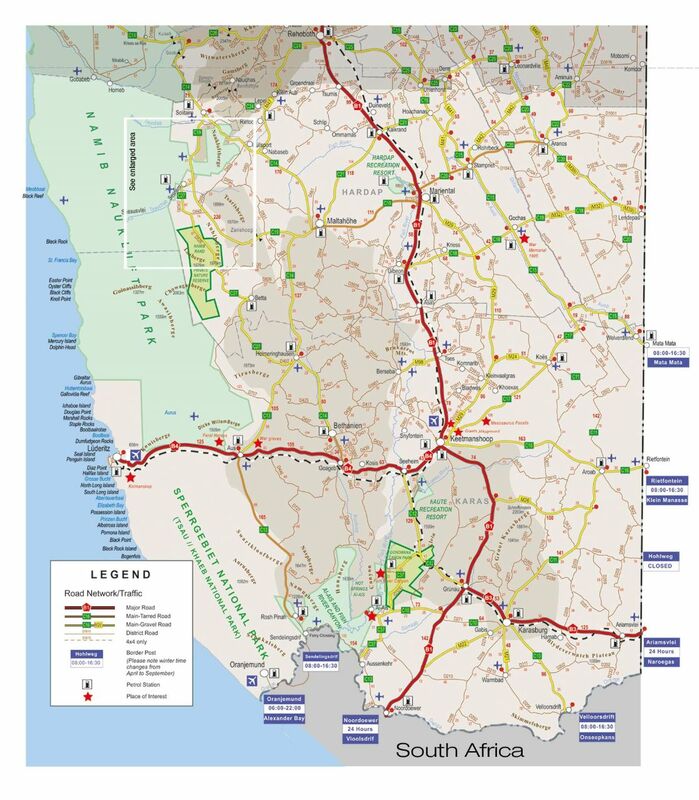 It is located 165 km's from Sendelingsdrif (the border between South Africa & Namibia) and 125 km's from Luderitz. Travelers crossing over the border do so via water ferry and often seek accommodation in Aus. Activities include a day trip to visit the wild horses near Garub. Aussenkehr is located on the banks of the Orange River not far from Noordoewer Border. Accommodation on the banks of the Orange River offers all kinds of activities and is perfect for families traveling through Namibia. River rafting on the mighty Orange River is very popular as is hiking, mountain biking & fishing. You may even see the wild horses which are known to roam in this area. The Fish River Canyon is a major attraction in Southern Namibia and a must see for tourists. Considered the second largest canyon in the world it is remarkable to see how this canyon has been formed over millions of years. The only lodge situated on the rim of the canyon offers hikes down into the canyon. Don't miss out! Accommodation in Gochas and the surrounding area is popular with travelers that have been to the Kgalagadi and are on their way to Sossusvlei, Fish River Canyon and the Namib Naukluft Park. Take a guided safari and experience the beautiful red dunes of the Kalahari Desert. Accommodation is available at a lodge or campsite. Grunau is a small village located alongside the B1 which is the main highway passing through the south of Namibia. Many travelers seek accommodation in this area as it is well located for those that have entered Namibia through its southern most borders. Sesriem to Luderitz via the C27 or D707 is the question many travelers ask themselves when on a self-drive safari in this part of Southern Namibia. The D707 is one of the most desolate, scenic and beautiful roads in all of Namibia. You will realize just how vast this spectacular country is when driving along the D707. Highly recommended….but take your time to fully appreciate the harsh beauty of the surrounding area. Kalkrand is a small village located in the Hardap region of Southern Namibia. It is located along the main B1 highway and offers convenient access to the Kalahari Desert. Travelers can select accommodation near Kalkrand at lodges, tented camps and camping sites. Go for a sundowner on the red dunes of the Kalahari Desert. Keetmanshoop is considered to be the capital of Southern Namibia. It is a popular overnight stop and accommodation is available via numerous guest houses and lodges. It is only about 80 kms from the Fish River Canyon and is ideal for day trips to numerous attractions such as the Giant's Playground and Quiver Tree Forest. Lüderitz is a harbour town steeped in history and offers accommodation in hotels and guest houses which normally includes free Wi-Fi. Free secure parking is offered by all accommodation establishments. Self-catering accommodation on the edge of the ocean is available as well as family friendly accommodation. Accommodation in Lüderitz also consists of hotels with their own restaurants as well as air-cons in their rooms. Facilities for disabled travelers are also available. Lüderitz offers many activities and day trips. The guest houses and hotels will provide you with information about visiting the famous Kolmanskop Ghost Town which is located in the Sperrgebiet or where to book your boat trip and visit Halifax Island and Diaz Point. See penguins, dolphins & seals whilst exploring Lüderitz Bay. Shark Island and the lighthouse are also worth seeing. Lüderitz is relatively small and can be explored by foot - look out for the two most famous German designed buildings: the iconic Felsenkirche (1912) and Goerke Haus (1910). Mariental is a small town located in the Hardap region of Southern Namibia. The Kalahari Desert is close by and Mariental offers easy and convenient access to this desert. Accommodation is family friendly and offers swimming pools and game drives. The red dunes of the Kalahari must be experienced! Mata Mata is a tourist access facility (border post) between South Africa and Namibia. It is located in the Kalahari Desert and provides access to or exit from the popular attraction of the Kgalagadi Transfrontier Park. Tourists can go on a game drive and see the Kalahari Lions as well as a lot of other game. The Naukluft Mountains is very popular with hikers and walkers. Travelers can stay at one of the nearby guest farms or lodges. Camping is also available. Nearby attractions include Sossusvlei and the famous Deadvlei as well as the Sesriem Canyon. 4x4 trips can be arranged into the Naukluft Mountains by your guest farm. Sossusvlei accommodation consists of lodges, guest farms and camping. Family friendly and self-catering accommodation is also available. Most of the accommodation options on this website are within close proximity to Sesriem – the entrance to Sossusvlei and the Namib Naukluft Park. Day trips from your lodge to Sossusvlei include visiting the famous Dead Vlei, walking through the Sesriem Canyon and climbing the dunes including Big daddy which is the highest dune in the area. Stampriet is a popular stay over for travelers wishing to explore the Kalahari Desert. Many travelers entering Namibia on their self-drive holiday via the Kgalagadi Transfrontier Park and Mata Mata stop here for their nights accommodation. Solitaire is a small settlement in Southern Namibia with a population of only about 100 people. It is a popular destination for tourists to stay over either on route to Swakopmund or Sossusvlei. Accommodation in the Solitaire area consists of desert lodges, guest farms and camping. Hot air ballooning is now available from Solitaire. Boutique Guesthouse Mariental is a new Luxurious guesthouse, in the center of Mariental in southern Namibia. A warm stay awaits you at this Boutique guesthouse.